You probably know by now that coconut is the bomb in terms of your health and waist line. Yes that tropical island dream, of lying underneath coconut trees is actually super good for you. Read here to catch up on its goodness and here for 25 ways to use coconut oil. So you should be convinced of this coconut glory. So now onto the good bit. I grew up loving bounty bars. I used to snack on them often (full-size adult versions as a ten-year-old) as the sweet coconut goodness made me happy – or so I thought before the diarrhoea, the mild obesity, chaffing thighs and crap skin. Now years later ( although not that many) I have come up with a naturally healthy version. This recipes is homemade and full of natural fats, much lower in sugar and contains no crap. They make the perfect cup of tea accompaniment and last for ages in your fridge or freezer. We ate them whilst watching the common wealth games opening last night (come on Glasgow!) and they were a hit. So rest assured that healthy (well healthier) chocolate goodness can always be at hand. So all you fellow bounty lovers enjoy this naturally healthy version AND if you want more naturally healthy sweet treats, like salted caramel brownies, DIY gummy sweet and scones then make sure you check out The Sweet Treat Collection for more sugar/gluten free goodness! 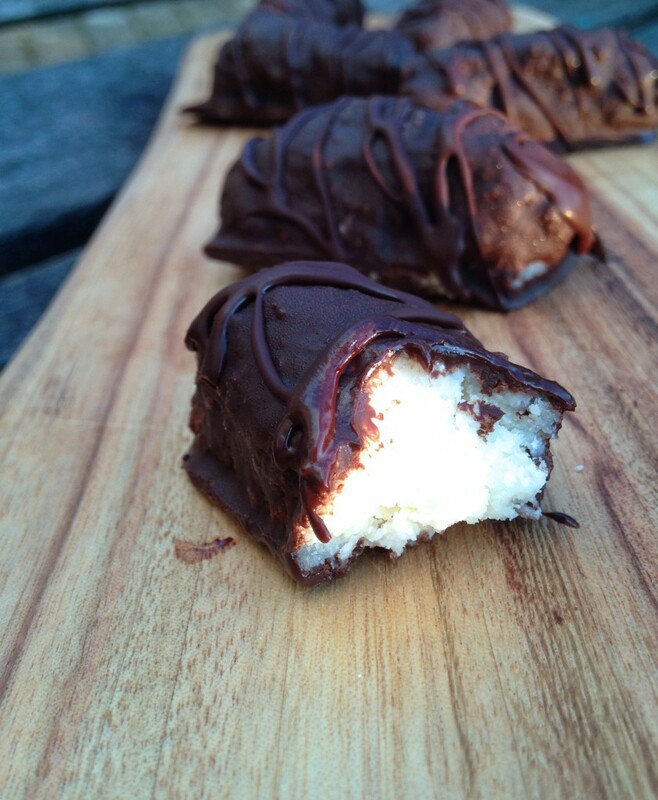 A naturally healthy version of bounty bars that are refined sugar free and actually good for you! Place all the filling ingredients in a food processor and blend until fine and it is coming together a little. Then using your hands shape into small log shapes. These are super rich so don't make them massive mine are about the size on a pinky finger. Place them on a flat surface covered in grease proof paper. Place in the freezer for half and hour. Meanwhile melt the chocolate coating in a double boiler system (i.e glass bowl over pan of boiling water). Then gently dip the coconut in the chocolate until fully covered, do this with them all and place on grease proofed covered surface again and place in the freezer. Eat once set and store in the fridge or freezer. As always if you can use organic ingredients as your body will be blessed. For a diary free version just replace organic butter with coconut oil and ensure chocolate is dairy free. I am making some of these tonight, can you just confirm you use 2 tbsp of coconut oil and 20g coconut oil?